Nearly 48 years ago, Tommie Smith and John Carlos stood on the podium during the 1968 Olympics and, as the national anthem was played, each raised a gloved fist to make a statement about the unequal treatment of blacks in America. Their silent gesture made people uncomfortable. Yesterday, Smith and Carlos were at San Jose State University, where they starred in the 1960s, as the school announced the return of the men’s track program. Confetti flew, people cheered and later Smith and Carlos were among the featured speakers during a two-hour panel discussion. Much of that passionate talk shifted toward current protests over problems of inequality in America, including the Black Lives Matter movement. The conversation, at times, appeared to make some of the people in attendance uncomfortable. The school plans to reinstate its men’s track program on Oct. 16, 2018 — the 50th anniversary of Smith and Carlos raising their fists after they won gold and bronze medals in the 200-meter dash at the games in Mexico City. Men’s track was cut in 1988 because of budget problems. San Jose State wanted to reconnect with its storied program, and has already raised $2 million for a new $5 million stadium adjacent to the school’s football stadium. 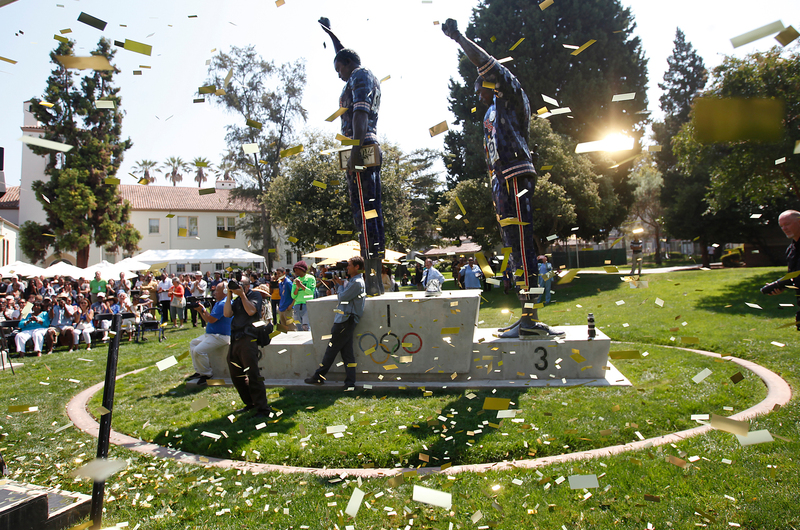 The outdoor ceremony — which was followed by the panel discussion and luncheon — was held at the base of a 23-foot-tall fiberglass, steel and ceramic statue unveiled in 2005 that captures the controversial medal stand moment that led to the two being banned for the remainder of the games. Nearly 500 people — including past and present school athletes — attended the announcement, which celebrated the history of a program that produced 43 world records and 49 American records between 1958 and 1979. 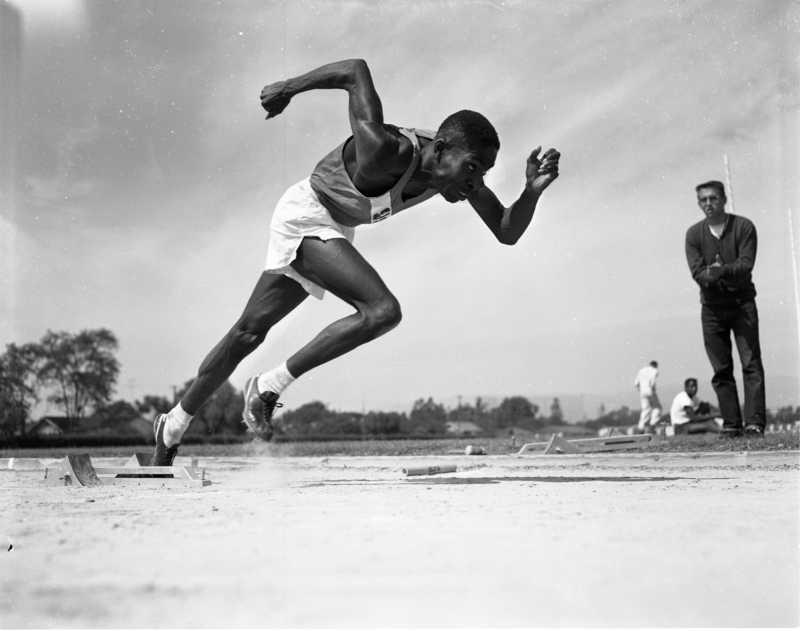 Back then, San Jose State was known as “Speed City,” and four people from the school — Smith, Carlos, Lee Evans (two gold medals in the 1968 games) and coach Bud Winter — are in the USA Track and Field Hall of Fame. While the program was developing runners who starred on a world stage, it also was known as a place where student athletes stood up for causes. Much of that activism stemmed from the creation of the Olympic Project for Human Rights, which was established in 1967 by Harry Edwards to raise awareness about racial issues in society and sports. Edwards had just earned his master’s degree in sociology from Cornell (he later earned his doctorate from there as well) when he began the program. He recalled being quizzed during the 1960s about the movement on the San Jose campus. Looking at Carlos and Smith — and the statue right behind them — Edwards got emotional as he spoke about the return of track and field to the school. Those giants — Carlos, Smith, Edwards and Evans — were later the featured panelists during a luncheon that included former track athletes. Their conversation was largely about the activism of the athletes that began when Edwards, who had been captain of the San Jose basketball team and threw the discus on the track and field team, returned to the school to teach in 1966. When Edwards, who had graduated from San Jose State University in 1964, came back, he found a campus that had few black professors, no black coaches, and black athletes who were unable to find housing because of landlords who refused to rent to them. 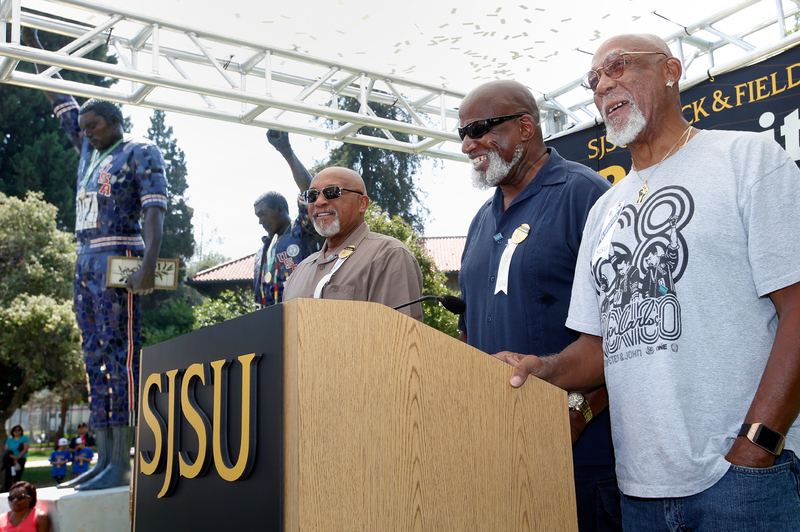 Sociology professor Harry Edwards stands between Spartan track star Tommie Smith, left, and John Carlos, as San Jose State University announces the return of the track and field program Monday, Aug. 1, 2016. The announcement was made next to the 24-foot-tall statutes of the two track stars famous ’68 Olympics salute. Eventually that led to the formation of the Olympic Project for Human Rights, which helped in the social transformation of African-American athletes on campus. The group attempted to organize a boycott of the 1968 Olympics by black athletes. Despite their stance, Carlos said that many high-profile athletes of his era didn’t embrace the activist role because of fear. He compared that wounded puppy to members of the current demonstrations throughout this country. Then Carlos made a pointed comment to the audience. Some in the cheered enthusiastically. Others sat silent. While the panelists were messengers from a different era, what they stood for still resonated with some of the youth there yesterday. Like Austin Morales, 21, a fourth-year student who waited patiently to approach the table occupied by Smith. Afterward, Morales, autographed poster in hand, spoke about what Smith and Carlos meant to the school. Smith, still holding court at his table, was asked what goes through his mind when he sees his statue. He turned his head and glanced at the giant likeness. “Look at that face of the young man up there,” said Smith, 72. “That was a cry for freedom and that was sadness. Which is why Smith understands the actions of the activists of the current generation. Like Smith and Carlos, they have decided to make people uncomfortable.